Cormorants and shags are members of the pelican family. Both are common round the coast of Arran throughout the year, but in Arran the shag is much more common than the cormorant. Both have small breeding colonies on Pladda. Both dive from the surface of the water to catch fish. They often dive with a quick arching forward plunge. Larger fish are brought to the surface before swallowing them. Both cormorant and shag are big, black, birds which you often see standing upright on a rock with their wings held out to dry. From studies done around the coast of Cornwall and in the Firth of Clyde, cormorants feed primarily on fish, crustacean, and other animals that live on or close to the bottom of the sea, while shags feed mainly on free-swimming forms. As well as living round the coast, cormorants use many inland sites in Great Britain, where they breed in a number of tree-nesting colonies. 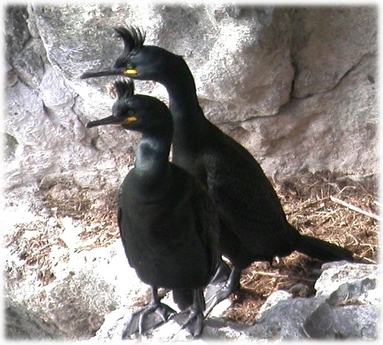 Shags on the other hand are generally restricted to the coastal habitats. In breeding plumage they are relatively easy to tell apart. The cormorant has a diagnostic white thigh patch and a white throat. The shag has a recurved short wispy crest and dark thighs. At other times, it’s the difference in size and shape that you have to rely on to tell them apart. Cormorants are altogether bigger. Cormorants have a bigger, more triangular head, a flatter crown and more massive bill. Shags are smaller and slimmer. Juvenile cormorants are browner and, unlike young Shags, have a variable amount of white on their belly.